If you live a busy life like me, then you know how hard it can be to find time to cook dinner. That's why you need a dutch oven in your life. You use a dutch oven for a number of things in order to make your life easier. For instance, you can slow roast your dinner in it allowing you to free up time to do other things. If that is not reason enough, you can also use the oven to bake bread, sautee vegetables, make a skillet cookie, cook stew or soup, and even fry stuff. Dutch ovens are the ultimate all-purpose cooking tool. The Dutch oven was initially created in the Netherlands. It was called a braadpan, which means frying pan or roasting pan. They created this braadpan out of brass and made a variety of pots, pans, and casserole dishes. Abraham Darby expressed interest in the Dutch technique of using sand to make molds for producing a quality dish with a smooth surface. He brought the Dutch technique back to England but chose to use cast iron because it was cheaper. He refined this more economical process and branded his result the "Dutch oven." These pots made their way to the Americas when colonists brought them from England. The settlers continued to make improvements to the oven during the colonial period, adding legs, designing flat lids, and creating a ridge to hold coals. As a matter of fact, the Dutch oven was versatile and durable, so it was a perfect cooking solution for exploratory adventures by Lewis and Clark and other famous discoverers. 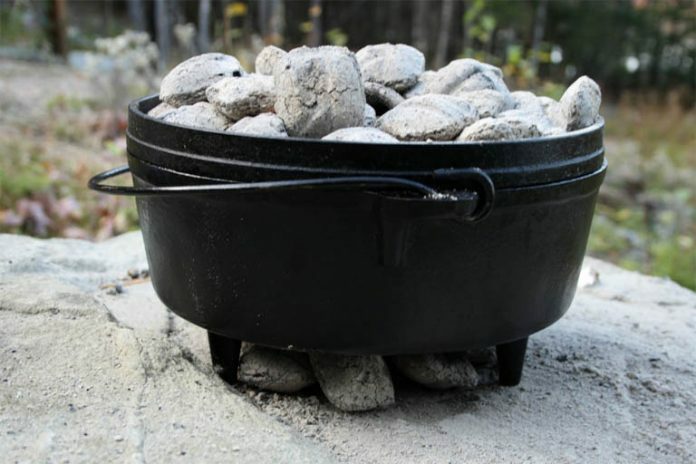 Pioneers, miners, homesteaders, and ranchers all used the Dutch oven, and it became a very prolific kitchen necessity. Today, you find that the majority of Dutch ovens are of the cast iron variety. Some are coated with enamel to reduce rusting, although if not cared for properly, the enamel can chip. Some are made of fragile, cheap metal, mimicking the same size and shape. However, they can’t be used at the same high temperatures, they don’t hold heat for as long, and they’re not as effective as the original. How Should I Use a Dutch Oven? Dutch ovens made from cast iron can be used for roasting meat, cooking casseroles, baking biscuits, and so much more. Cast iron takes a long time to get hot, but holds heat for a long time, and at a steady temperature. They’re very economical because you can leave your oven at a lower temperature and still get the same results. 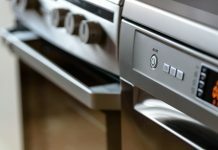 Toward the end of cooking, you can even turn your oven off and let it cook the rest of the way on its own. Enamel coated Dutch ovens are suitable for cooking anything acidic. Acidic foods cause cast iron to rust, so an enamel coating prevents oxidation and it’s easier to clean and maintain. While cast iron tends to cook better once it’s well seasoned, it can be a maintenance nightmare. The enamel coated variety eliminates a lot of the work. 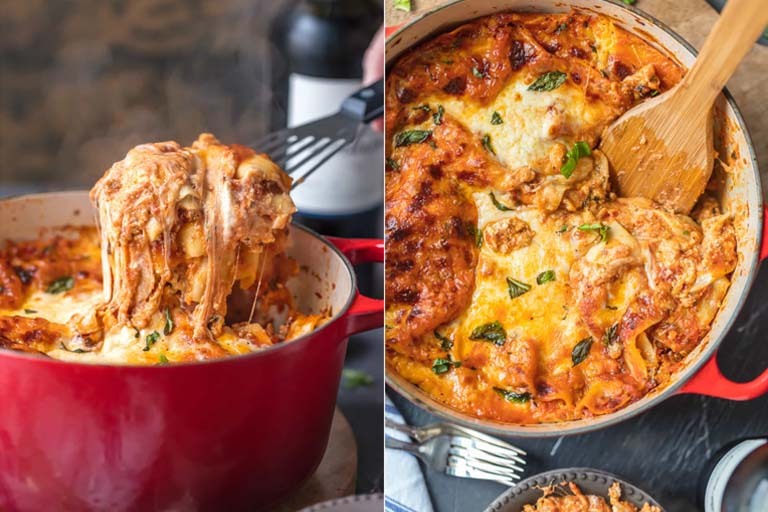 Dutch ovens that are made from thin metal are cheaper, but they don’t last long, and you can’t rely on the cheap ovens to retain heat or cook your food as effectively. Many would argue that these aren’t Dutch ovens at all, and I tend to agree. They look like Dutch ovens but don’t perform the same function. Dutch ovens are traditional but trendy. This year, Dutch ovens top the market, and there are a wide variety of options. If you want the best Dutch oven your money can buy look no further than our top ten list below. Lodge manufactures baking dishes, pots, pans, and other stoneware. Joseph Lodge opened a cast iron foundry in Tennessee in 1896, and it’s still in operation today. These items are all American made, quality products, which is why a significant portion of our list is comprised of Lodge Dutch ovens. The Lodge L8DOL3 Dutch oven has a five-quart capacity and a seven-quart capacity option. It comes with a limited warranty. The pre-seasoned vegetable oil formula keeps it from rusting, gives your food additional flavor, and makes it easy to clean. The handles make it easy to carry, and the self-basting lid preserves moisture. True to its Dutch oven roots, the cast iron absorbs heat slowly and maintains its temperature for a long time, meaning it’s ideal for cooking foods slowly. This locks in the moisture, making your meat tender and giving it great flavor. Perfect for chicken, beans, rice, and braises, you can use this Dutch oven out of the box. The flat bottom makes it great for the stovetop or oven. You can even use it outdoors at the campfire, and its non-stick surface makes it easy to clean. $77.68 on Amazon. Both top the list of 2018's best Dutch oven for cooking. The Lodge EC6D43 falls in the middle of the two L8DOL3 varieties at six quarts, and it comes with a lifetime warranty, making it well worth the $60 price tag on Amazon. While it says it’s dishwasher safe, we still recommend washing all cast iron by hand to eliminate oxidation. However, you should take comfort in the lifetime warranty, knowing that if anything happens, Lodge will replace it for free. 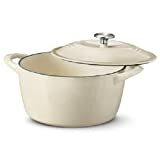 This Dutch oven has two coats of porcelain enamel protection and is safe for both the stovetop and the oven up to five hundred degrees. The gorgeous Island Spice Red exterior and the cream-colored interior ensure that this is a piece you can be proud to display to your family and guests. It is a beautiful addition to the list of 2018's best Dutch oven for cooking. The Lodge L9DD3 has a five-quart capacity and a lifetime warranty. It’s pre-seasoned with Lodge’s proprietary vegetable oil blend and then cured at a high temperature to ensure deep penetration of the oil into the surface of the cast iron. The lifetime warranty alone is enough to put this one at the top of the list of 2018's best Dutch oven for cooking. $39.90 on Amazon, this Dutch oven is a bargain. It is not dishwasher safe and shouldn’t be used outside. Check on Amazon for cream. Also available are red, teal, bronze, orange, and purple. 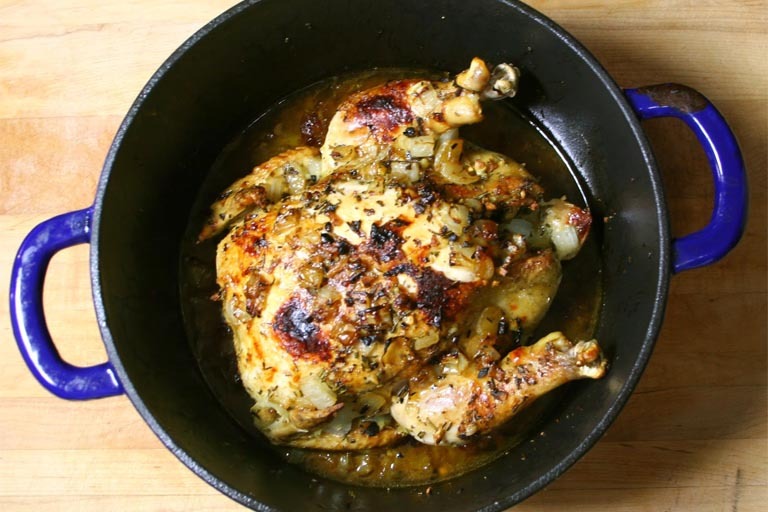 This Dutch oven is a truly multifunctional, perfect for meat, poultry, and vegetables that are tender and flavorful, as well as perfectly cooked casseroles. You don’t need to season this cookware to get fresh flavors from your food, and you can use it in the oven or on the stove. The bottom is insulated so you can set it directly on the countertop or table without protection. Bonus multifunctional cooking points for this item on 2018's best Dutch oven list. 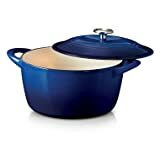 With a capacity of six quarts, the beautiful blue Lodge EC6D33 is 10 ¾ inches in diameter and 4 ½ inches deep. The chip-resistant porcelain-enamel finish offers a significant layer of protection while making it easy to clean. You also don't have to settle for blue if that's not your thing. Check out red, green, gray, indigo, lagoon, chrome, poppy, or purple. The side loop handles make it easy to carry, so you can make a casserole and take it your next potluck. It is oven safe up to five hundred degrees, and the self-basting cover traps heat and retains moisture and nutrients. Hand washing and silicone utensils are recommended for this piece so that it doesn’t get scratched. $59.97 on Amazon, it’s an excellent price for the size and the features. Bonus price points for this Dutch oven on our 2018's best Dutch oven list. While this Tramontina is only 6.5 quarts and oven safe up to 450 degrees, its enameled cast gives you superior heat retention and evenly distributed heat. It’s fantastic for baking, grilling, and slow cooking. The stainless steel knob makes the cover easy to remove and check progress, and you can use it on gas, electric, and induction cooktops. You can also set this one directly on the table without causing heat damage. Similar in price and color options to the Tramontina 6.5 quart covered enamel cast iron Dutch oven, you can find it on Amazon. The Caribbean Blue Lodge EC7D33 Dutch oven will brighten your spirits. It’s the largest Dutch oven on our list, clocking in at 7.5 quarts. 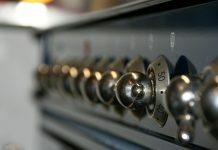 You can use it on all types of cooktops, and it’s safe in the oven up to five hundred degrees, which is pretty standard. However, you cannot use it in the microwave, on grills, or at the campfire. $99.54 on Amazon, it is one of the more pricey options, but it’s gorgeous, large, and functional. The six quart capacity of this Lodge L12CO3 Dutch oven comes with a lifetime warranty and is perfect for the outdoors. If you do a lot of fireplace or campfire cooking, this is your go-to tool. It’s pre-seasoned to seal in flavor, but it’s not enamel-coated, so it’s slightly more difficult to clean. While maintenance on Dutch ovens that don’t have an enamel coating requires a bit more work, it’s worth it for that smokey, campfire flavor. The twelve-inch diameter and 3.75-inch depth make it wide and shallow, distributing heat more evenly across the bottom for a fire that may or may not always have a steady burn. $71.93 on Amazon is a steal for this cool Dutch oven. A seven-quart capacity and dual handles make this Lodge L10DOL3 Dutch oven portable and convenient. Pre-seasoned with Lodge’s proprietary vegetable oil blend, the cast iron lid is always perfect for slow cooking foods. The rugged cast iron construction provides even heating and ideal heat retention. $54.90 price point on Amazon is on target for this list of 2018's best Dutch oven for cooking. For the sake of seeming inclusive, we’ve added the Calphalon Dutch oven to our list of the best. Calphalon has long been known for manufacturing quality cookware, but most people think of pots, pans, and utensils. However, this Dutch oven touts two layers of nonstick interior and has silicone handles that can stay cool even on the cooktop. 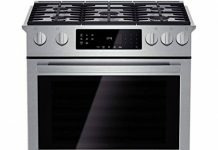 Oven safe up to four hundred degrees means you can’t cook at as high of a temperature as some of the others, but the tempered glass lid allows you to check progress without letting valuable heat escape. Place this baby directly on the table from the oven to make serving easy. 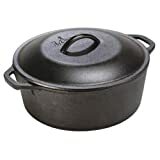 at Amazon is a great value, but some may not consider this a true Dutch oven because it isn’t made of cast iron, and it’s the only one we included on our list that’s not. But it has a ten-year warranty and is an affordable option that’s easy to clean and maintain. You can’t go wrong with any option you choose. Any of these Dutch ovens could be considered 2018’s best Dutch oven for cooking. Evaluate your needs to decide what will work best for you and your cooking habits. If you do a lot of outdoor campfire cooking, the Lodge L12CO3 camp Dutch oven is the best bet. 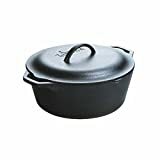 If you need a large Dutch oven, the 7.5-quart Lodge EC7D33 enameled cast iron Dutch oven is the best choice. No matter what you choose, you’ll be satisfied with your choice because they’re all great. Happy camping!